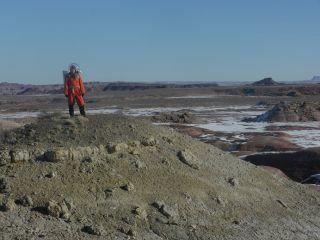 Journalist Elizabeth Howell atop a ridge, wearing a spacesuit, at Utah's Mars Desert Research Station. HANKSVILLE, Utah – My nose was running. Instinctively I reached up but was startled when my hand crashed against the helmet lodged on my head. I was about half an hour into my first walk in a Mars-like environment, and I knew I'd have to wait about another hour before I could grab a tissue. The 76-minute "Marswalk" Monday (Jan. 6) took place at the Mars Desert Research Station in Utah, where I and the rest of Crew 133 are spending half of January operating as though we are on the Red Planet. The "spacesuit" I wore is not quite the real deal, but it's close. A minor nose problem didn't seem reason enough to break "sim" yet, though. In front of me, commander Paula Crock was leading me across the terrain. At one point, she stopped and shouted through her bowl, "These are fossilized shells!" The shells were in fact stretching for dozens of feet in front of us. I felt like I was indeed on another planet, instead of simply pretending to be. The mission I'm participating in — which is run by the nonprofit Mars Society — aims to figure out science experiments, engineering technology and overall procedures that would be useful on Mars one day. This includes "Marswalks" in which crew members don spacesuits and do geology and other work in the area around MDRS. Safety is the primary consideration. At least two people go out on each spacewalk, carrying a first-aid kit. (Crock also has wilderness first-responder training.) Each person on the spacewalk carries a radio to talk to the "Hab," the habitat where we're living for two weeks. Periodic communications checks occur to make sure everybody can hear each other. As a first-time Marswalker on a training run, my two main concerns were staying upright and making sure I was going in the right direction. Crock let me lead the navigation briefly on the way back. I walked right past our footprints from the trip over, requiring a call back to the path. Walking wasn't a problem on straight stretches, but going up and down hills proved more difficult because the backpack made me more top-heavy. I was taught how to plant my feet on hills to get up and down more safely, which helped. The terrain was somewhat treacherous as well. Thin layers of ice covered pools of water on our path, and I did a sort of penguin walk with small steps to get over those spots safely. The snow also masked sand traps, so we tried to walk on the dirt where possible. In between my thoughts about safety, however, I took some time to enjoy the incredible views. Just before we turned back, Crock pointed up a nearby hill — a somewhat steep one — and encouraged me to get on top of it. Round hills stretched around me on one side, a jagged mountain on the other. Elizabeth Howell will do a two-week simulation at the Mars Society's Mars Desert Research Station from Jan. 4 to 19. Have a burning question about the mission or a picture you really would like to see from the site? E-mail contact@elizabethhowell.ca for the chance to get your question answered in a future story.